MH370 Not The Only Mystery – footsteps…….. Missing Malaysia Airlines (MAS) Boeing 777-200ER, MH370 is not the first plane of such mystery. However it has created the most chaos because of the presence of the social media and involving 26 nations in the Search and Rescue operation that today (22 March 2014) enters its 15th day since area missing on the 8th March while en route to Beijing from Kuala Lumpur. The search area had been extended to 2.97 million square miles. Besides MAS flight MH370 there are other 5 mysteries involving airborne objects dating back to 1856. 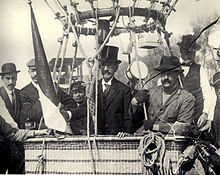 Matiaz Perez, took off from Havana, Cuba in a balloon in 1856 and was never seen again. Without any tracking technology of modern aircraft, there was no way of tracking him and was believed he fell into the ocean. Air France 447 disappeared from radar screens three hours after take off from Rio de Janeiro. It took five days for search crews to discover the wreckage of the Airbus A330 in the Atlantic Ocean, and two full years before the flight data recorder was recovered from the bottom of the sea. It was later determined that the plane — which was flying on autopilot — had crashed after ice crystals formed on the flight instruments, which forced the plane’s autopilot equipment to disconnect, eventually causing the plane to stall. All 228 passengers and crew on the flight died. Boeing 727-223 disappearance occurred in 2003 when it was stolen from an airport in Luanda, Angola. Formerly an American Airlines passenger jet, the plane was leased to an Angolan airline and subsequently grounded for financial reasons. It’s believed by some that an American mechanic named Ben Charles Padilla was on board when the airplane taxied down the runway and took off. Padilla has never been seen or heard from since, and the plane has never been found. Was Padilla alone when he took off? Did the plane crash into the Atlantic Ocean? Most analysts have concluded that the aircraft’s transponder was disabled or missing, making retrieval an unlikely event. Though numerous conspiracy theories exist, the mystery has never been solved. Uruguayan Air Force Flight 571 The most infamous airplane disappearance ever, a 1972 chartered flight carrying 45 people from Uruguay to Chile crashed due to pilot error in a remote spot high in the Andes Mountains. Searchers from three countries looked for the plane, but after eight days, the search was called off. During that time, the wreck’s 27 survivors struggled to remain alive in extreme cold with little food. After an avalanche killed an additional eight people, and with little hope of survival — especially after hearing a radio report that their search had been abandoned — the remaining survivors resorted to cannibalism. Two people from the crash site, however, were able to trek through the mountains and find help. After 72 days, the last of the wreck’s 16 survivors were rescued. Flying Tiger Line Flight 739 In 1962, a Lockheed L-1049 operated by the flying Tiger Line was transporting U.S. servicemen from California to Vietnam. After refueling at an air base in Guam, the airplane and all 107 passengers disappeared somewhere over the Pacific Ocean. After an eight-day search involving thousands of people from the U.S. military, the search for the aircraft and any survivors was called off. The crew of a Liberian tanker claimed to have seen a bright light in the sky at roughly the time the flight would have passed over, according to TIME, but the disappearance of the aircraft remains a mystery to this day. Glenn Miller Glenn Miller one of the most celebrated musicians of the 20th century, leading the Glenn Miller Orchestra to international acclaim and an enlisted airman during World War II. Before a scheduled appearance at a Christmas concert in Paris, Miller took off from an airstrip in England under heavy fog with his pilot, Lt. Col. Norman Baessell. Miller never arrived at his concert in Paris, leading to numerous theories about his disappearance. If SAR fail to find and solve the mystery of MH370, it will be written in history as a technological age mystery because the SAR was conducted with the most modern and most sophisticated technological tools and even satellites. 26 nations (to date) involved. Next Post MH370 Whats In The Cargo Hold?